The Food Poverty Line (FPL). This refers to the amount of money that an individual will need to afford the minimum required daily energy intake. It is R 3 840 per annum per capita in 2010 prices. 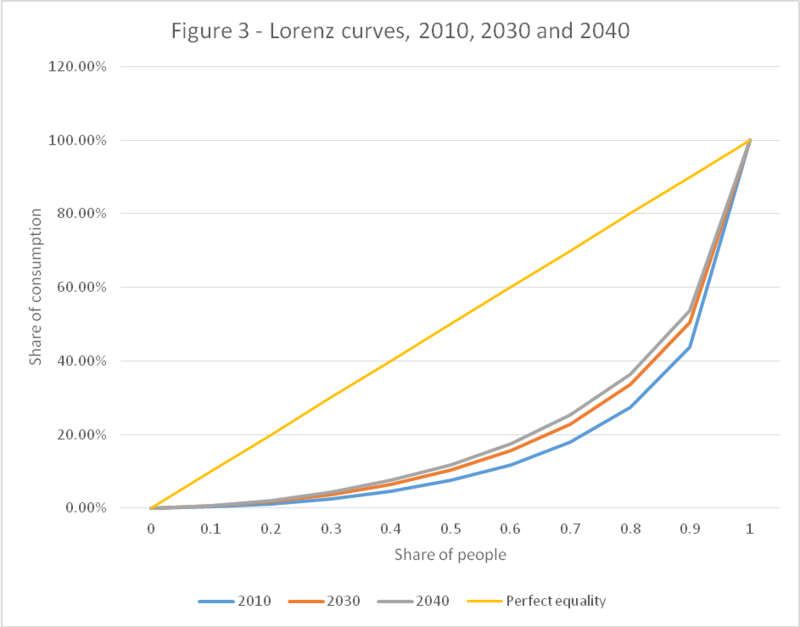 The Lower Bound Poverty Line (LBPL). This refers to the food poverty line plus the average amount derived from non-food items of households whose total expenditure is equal to the food poverty line. It is R 5 592 per annum per capita in 2010 prices. The Upper Bound Poverty Line (UBPL). This refers to the food poverty line plus the average amount derived from non-food items of households whose food expenditure is equal to the food poverty line. It is R 8 796 per annum per capita in 2010 prices. A projection is not a prediction. It is what would happen if the model assumptions were satisfied. The outcome will depend on good or bad luck, which cannot be controlled, and on good or bad policy, which can. It is possible to be overly influenced in the choice of assumptions by current mood. We have guarded against this possibility by using projections of GDP and population from international institutions: the IMF, the OECD and the UN. Accordingly, there are upside risks and downside risks to the base line projection. The upside risks are good luck and good policy. The downside risks are continuing stagnation, or even economic decline. The NDP was intended to rally the nation around a high growth strategy. This it has failed to do so far. Instead of a growth rate of 5.4%, the average growth rate between 2012 and 2019 is estimated at 1.4%. 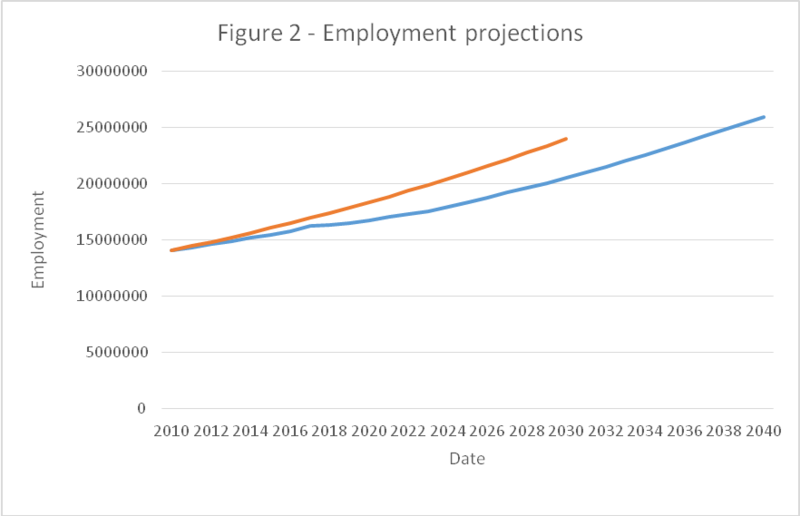 The failure has the consequence that the economy will be much less advanced in 2030 than the NDP projection. Projections which are unrealistically optimistic pose dangers. They can induce inappropriate policy on the provision of education, health, human settlement and income support, as well as poor public investment decisions. In policy terms, attention to growth has been very limited since 1994, and non-existent over the past decade. This has not been for the lack of good advice, but for the unwillingness to take it. Professional educational discourse refers to cheating in examinations as ‘rapid learning technique’. Large swathes of our elite have been much more interested in rapid accumulation technique than pro-growth policy. 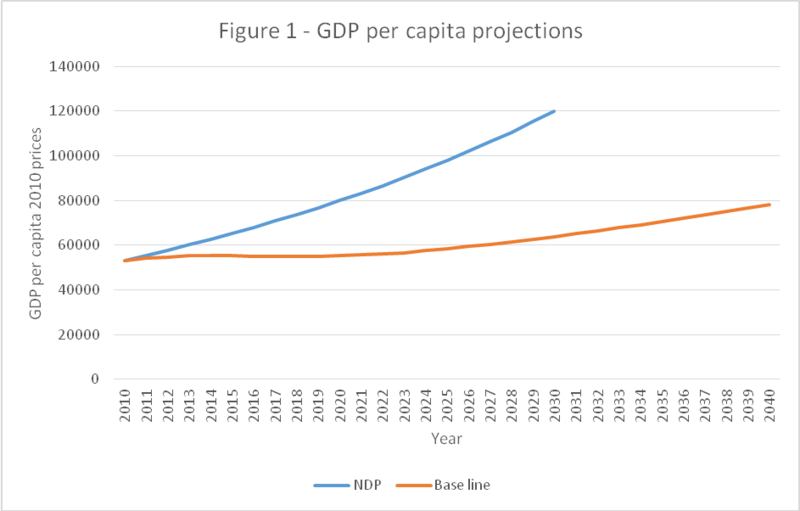 The fact that the NDP assumptions about GDP, employment and poverty are dated does not invalidate the many suggestions it contains about initiatives to improve the growth rate. Indeed, there is a need for a review of current status in relation to them. There is no single factor which will move the country forward. For instance, increased foreign direct investment will help, but it needs to be accompanied by attention to factors limiting domestic investment in the domestic economy. 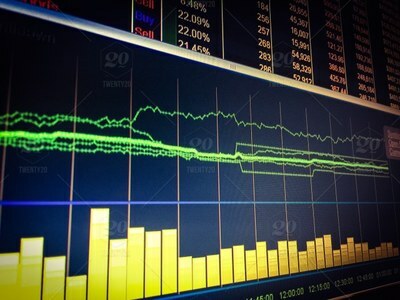 Rather, what is needed is a series of mutually supportive measures to remove the constraints on growth, and this will require large changes in mentality. Unless these changes materialise, we shall continue our slide down the world economic league table.